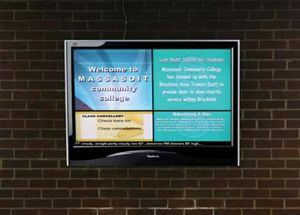 MASSASOIT, MA—Communication has never been easier at Massasoit Community College in Massasoit, MA, now that MCC has installed a new digital signage system with ties into its cable TV system. New digital imaging capabilities, video server, and optional On Demand server have brought simplicity and sophistication to a system that once consisted of note-covered cork boards and pushing buttons on VCRs. Each monitor is divided into four quadrants in order to customize signage content for the two Massasoit Community College campuses. The addition of the Video on Demand server adds yet another dimension to the picture. If Krasnow wants to make a program available to viewers whenever they want to watch it, he simply checks a box in the user interface. MCC staff record all new programming digitally, but they can also schedule any non-digital content, such as older videotape programming, just as easily for playout. When these analog programs are played, the system automatically records them digitally and store them on the server for future use. Massasoit’s older bulletin board technology made it an ideal candidate for upgrading to Tightrope Media System’s Carousel digital signage technology, which can be used together with the Cablecast Pro software. A network of 15 52-inch Viewsonic LCD monitors hang in the busiest hallways and favorite gathering spots on both of Massasoit’s campuses. Each monitor is connected to a small Carousel 220 player that accepts the digital feed from the system’s head end, in this case located at the Brockton Campus. Rather than mount the player to the rear of each monitor, Dorsey says they opted to run Cat-5 extension cable to nearby rooms or closets where they installed the players. While most monitors are taking the signal from a dedicated player, some players are feeding more than one monitor where the content is the same. At the head end, Cablecast Pro, which can handle up to 200 channels of digital signage, is rack mounted along with the playout server, VOD server, and a variety of playback and audio technology. Signage content is customized for each campus. By dividing each monitor screen into four quadrants, Krasnow can post universal information in one quadrant, build specific data in another, and perhaps run information on class cancellations, club meetings or sporting events in the others. Even better, he doesn’t have to do all the production work himself.